I’ve been getting tons of zucchini and summer squash from my CSA. It’s a challenge to keep up with them all, but these muffins are definitely going to be made again. After my cousins came over for an impromptu sleepover, I made these in the morning to give them a healthy treat for breakfast. Everyone loved them. They’re the perfect texture, light, tender and moist. A hint of cinnamon and some chewy oats make these one delicious breakfast. Preheat oven to 350°F. Grease two muffin tins with cooking spray and set aside. In a bowl, whisk together flour, baking soda, cinnamon, salt, baking soda, and sugars together. In a mixing bowl, beat the eggs and oil together until light and well combined. Slowly add in the dry mixture until just combined. Fold in the oats and zucchini. Scoop the batter evenly into the prepared muffin tins (I used a 4oz scoop). Bake muffins for 17-20 minutes or until golden and a toothpick inserted into the center comes out clean. Remove muffins from the tins and allow to cool on a wire rack. Lauren, I love your recipes! I was wondering if you ever experimented with using less sugar in any of the sweet recipes. 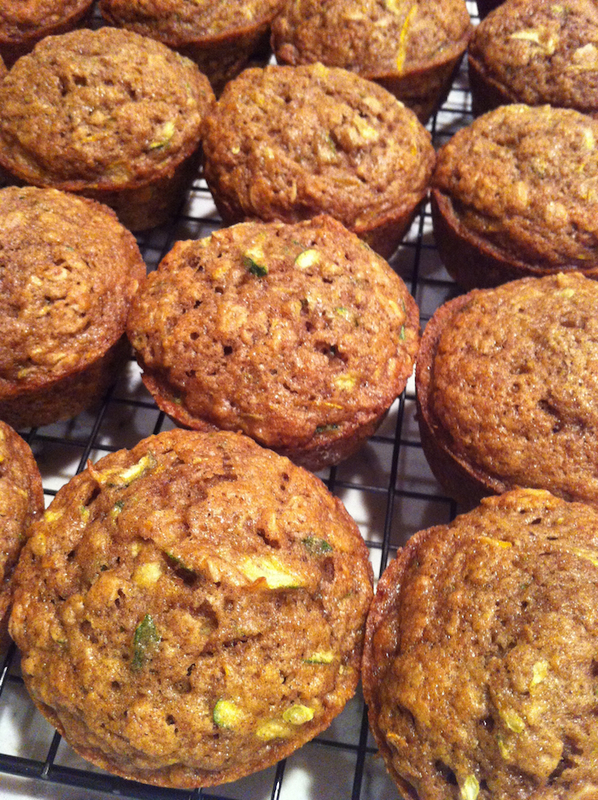 I plan to try the zucchini muffins with less and maybe substituting either maple syrup or honey. Thanks, Sheri! I do typically reduce the sugar in most of my baked goods–I’ve read that especially most older recipes the sugar can be reduced by about 1/3 without affecting the recipe. You can probably reduce the sugar some more in this recipe. I wouldn’t recommend substituting too much maple syrup or honey for the sugar because it’ll make the recipe too wet. But experiment and let me know what works best! I think maple syrup would pair nicely with the cinnamon! Made the muffins last week and added mini chocolate chips – good addition. I questioned the amount of Baking Soda listed twice and made alterations there also. I love getting your frequent emails and look forward to making more of your recipes.